At the French Touch we understand how important your wedding day is and we can help make it even more memorable with our unique approach and beautiful displays that will reflect your personal tastes and dreams. 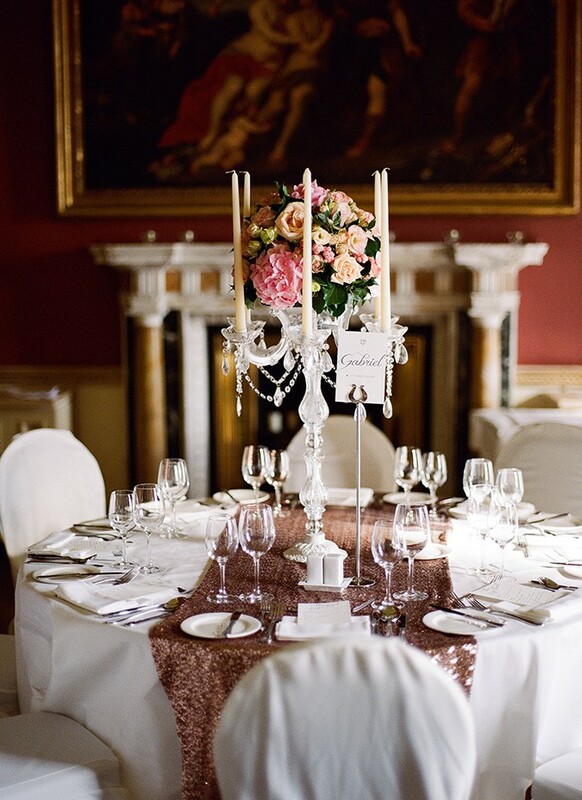 We offer elegant custom made solutions for weddings all over Ireland. 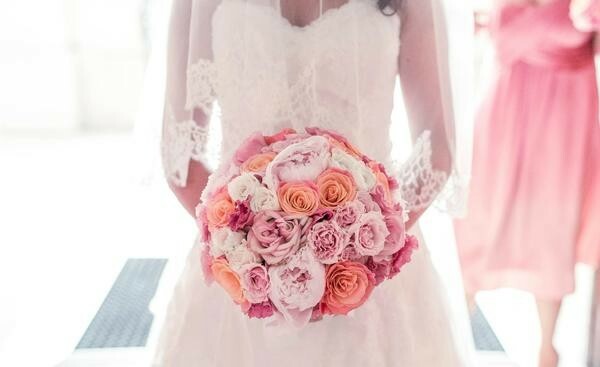 We guarantee to have for your special day, the finest flowers flown in directly from Holland, bringing the very best in style, beauty and colour to all aspects of your wedding. We make the entire process seamless, working with you from the moment you start planning your arrangements. You can be assured that you will have that individual touch of elegance, glamour and splendour throughout your wedding day. We also have available to hire, a selection of glass vases, urns and pillars and all types of candelabras and candle stands for the church ceremony. We look forward to working closely with you in realising what you require to make that special day unforgettable. All i can say is Thank YOU !! the flowers were amazing everyone was telling us that the flowers in the church were fabulous and made the church just look so full from the door to the alter with all the flowers along the isle.Both mothers got 2 weeks out of the back alter pieces they were very happy with them. Just for my own flowers on the day the bouquet was amazing it was just like my grandmothers on her wedding day . Stephanie was so lovely to deal with. From the moment I emailed her to the day of the wedding, she was so approachable and helpful. Loved all her ideas and tips. When I seen my bouquet on the day- it was nicer than I even imagined!! Absolutely loved all our flowers. We ordered flowers for the bride and bridesmaids hair, which were done on a little comb- everyone admired them. Thanks Stephanie- would defiantly recommend The French Touch Flowers. 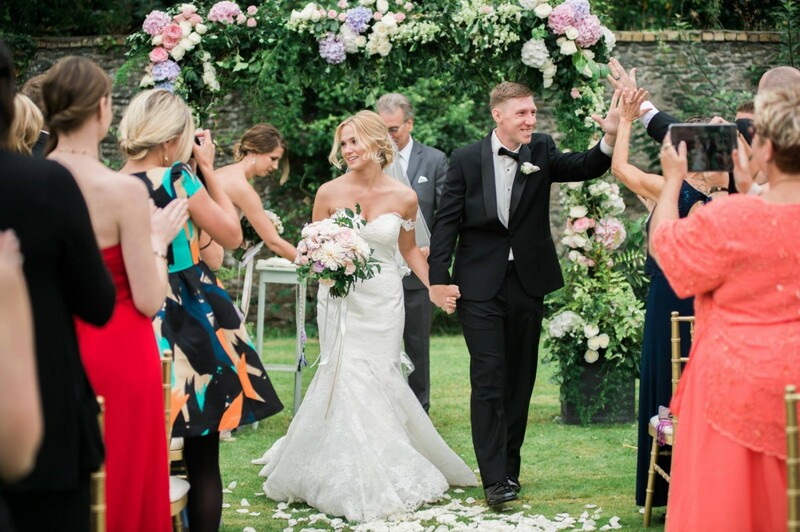 The French Touch made our floral dreams come true! 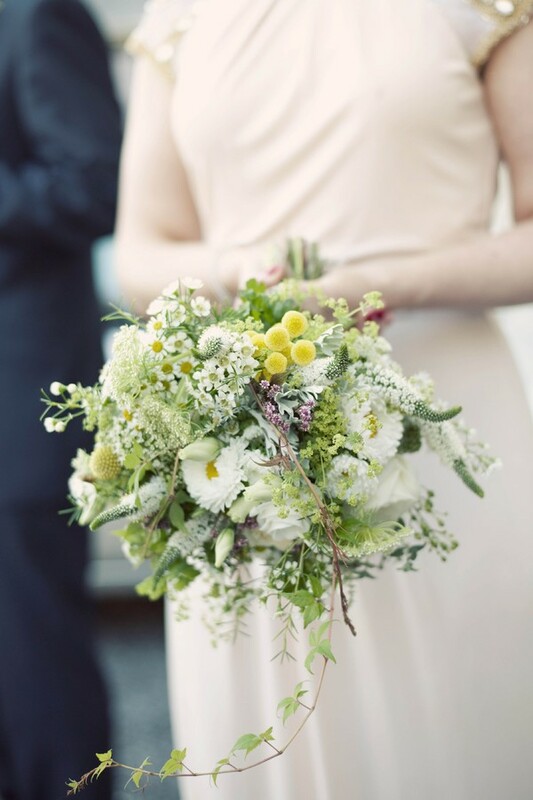 Stephanie is a skillful and meticulous floral designer. Her attention to detail is inspiring and you truly notice the difference her creativity makes on the day. Everything came together flawlessly or at least she made us feel it did:) You won't find anyone better in Ireland if you want something truly special that will leave your guests talking. Thank you so much Stephanie for all your hard work and commitment in realising our vision. You are amazing!!!! We cannot thank the French Touch enough for the fabulous flowers on our wedding day. We received so many wonderful comments from our guest on the day and afterward. Simply stunning. Will definitely recommend to a friend. From the moment I met with Stephanie I knew she was the florist I wanted for our day - her attention to detail and suggested options was outstanding. Stephanie totally understood the look I wanted to achieve from button holes, bouquets to church decoration and venue, which was put together initially as a very detailed and colorful pdf proposal Stephanie also accommodated last minute changes (mothers decided they did want corsages after all, increase in numbers for napkin flowers) without any fuss - we were blown away on our day by how magical, sophisticated it all looked it exceeded my expectations. Hi Stephanie, I hope you had a great Christmas and a wonderful New Years! I just wanted to send an email to say thank you so much for the AMAZING flowers you created for our wedding on Dec 12th . 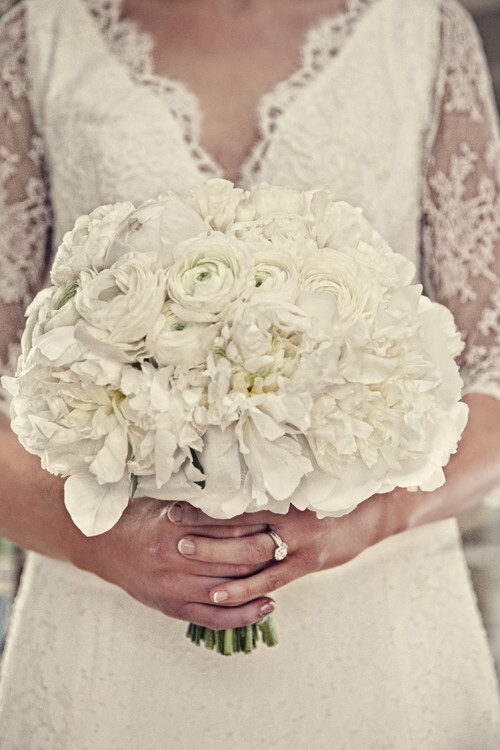 I could not believe how beautiful my bouquet was it took my breath away when I saw it on the morning. Both the flowers in the church and the reception were truly unbelievably spectacular and surpassed any expectation we ever had for the day. So many people commented on the flowers from the Arch display to the pew ends to the flowers in the reception the list goes on and on… When we first met you in the Shelbourne I knew we were in safe hands and I never once worried how the flowers would turn out as I knew you were a professional from day one! You are not just a florist but truly a wonderful artist! I would not hesitate in recommending you to anyone as they would be lucky to have you!! I wish you all the best for the future, Thanks a million. Thank you very much for providing us with such beautiful flowers for our wedding day. You were a pleasure to deal with and extremely professional. We had so many comments from our guests about how lovely the flowers looked in the chapel. From the moment I met Stephanie from The French Touch I was at ease. Her attention to detail, professionalism and ability to understand our dream was such a joy. Paul and I wanted to achieve a glamorous candlelit dinner for our wedding banquet. I met with Stephanie twice to discuss our dream and on the 28.12.13, The French Touch turned our dream into reality. We had our wedding reception at the Village at Lyons and the table settings created by The French Touch were STUNNING! We wanted candles instead of flowers for our tables and Stephanie brought creativity to another level! It was spectacular. All of our guests were speechless! And are now still talking about it! 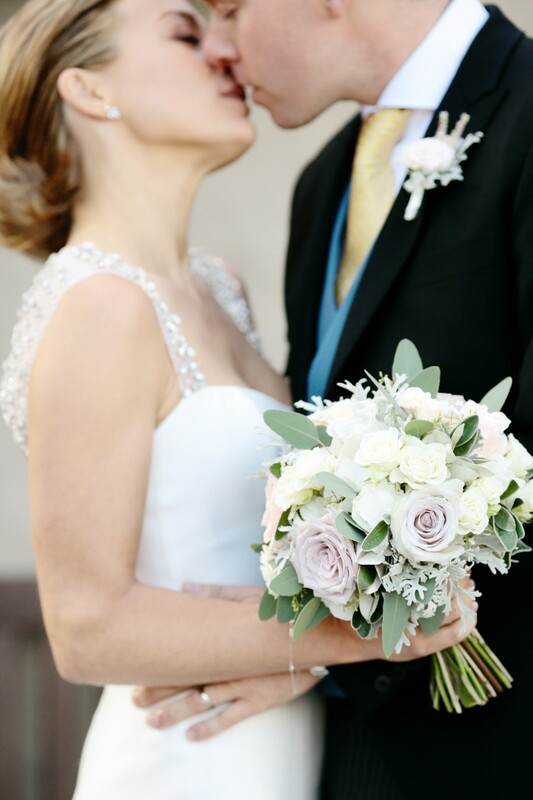 My dress and head piece were of vintage style and the bouquets were a match made in heaven. I couldn't have wishes for flowers more beautiful. 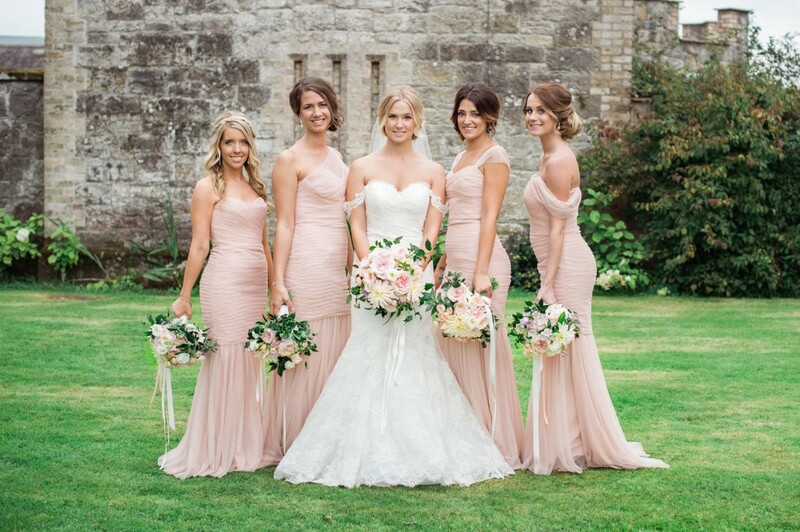 Stephanie guided me on the most suitable flowers and textures for the time of year and for the bridal party colour scheme and wow were they fabulous! I am so very pleased I chose the French Touch to design my flowers and table setting for our wedding. They were simply wonderful. Fantastic, professional and truly talented people. I can't complement them enough. Thank you Stephanie and Justin and all at the French Touch for bringing our wedding day dream to life. The French Touch provided us with the most incredibly beautiful floral arrangements I have ever seen for our wedding last September. They were everything that I had hoped for and more, and were simply stunning. 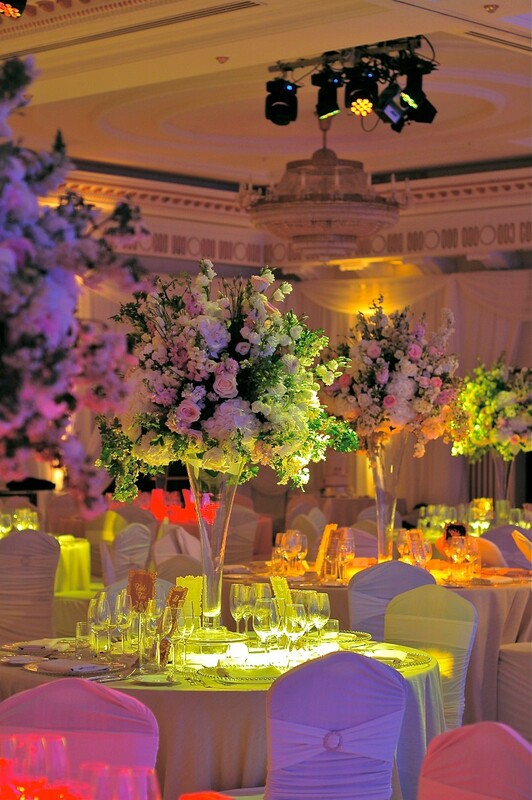 Absolute professionals and floral artists, resulted in the most most elegant bouquets, urns, and centre-pieces. The variety and freshness of flowers used was superb.The French Touch Team are in a league of their own! !Thank you again!! To Stephanie & Justin We just wanted to sincerely thank you for the amazing flowers you prepared for our wedding day on 11th May. All the arrangements were beautiful and elegant (the bouquets, the altar flowers & pew ends and centrepieces for the candelabras) and looked even better than we'd imagined. You understood exactly what we wanted (colours and look), we were thrilled with your work and it deservedly received many compliments from our family and guests. Your flower arrangements surpassed your expectations and I would highly recommend The French Touch to future brides. Merci Beaucoup! Words cannot describe how wonderful it was working with Stephanie and Justin. I was planning my wedding from abroad and they were both so prompt and easy to talk with. My wedding guests are still raving about the flowers on my wedding day! The arrangements from the ceremony to the reception were even better than I had anticipated. My flowers were one of the most important aspects of my wedding day and I couldn't have been happier with The French Touch's work! Review by Louise and Derek , Wedding 12th of April, 2013. My journey began like many other brides... So many vendors, so many choices, so many opinions... So little time! 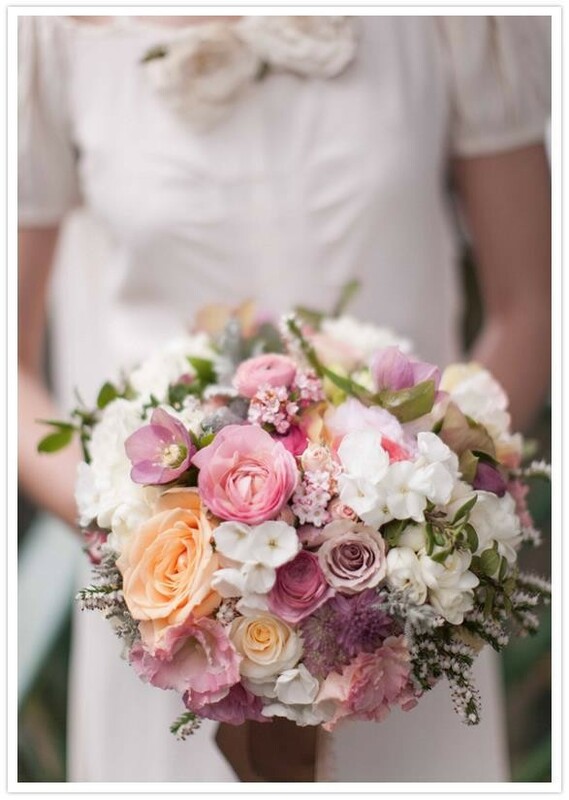 But the one decision that came naturally was to choose French Touch floral design for my wedding flowers. French touch had come highly recommended by our wedding venue but as an anxious bride, you want to establish that valuable relationship with your vendor yourself so that you can put your trust in them and this was so simple with Stephanie from our first meeting. She exactly got my dreams, thoughts and my expectations of what my wedding day was to be. French Touch was the best decision I made ( apart from marrying my husband! ). The journey from beginning to the wedding was simple, straightforward, relaxed and happy with Stephanie and Justin. We had a generous budget but French Touch made it look like we had spent a million euro on the flowers... They were spectacular! 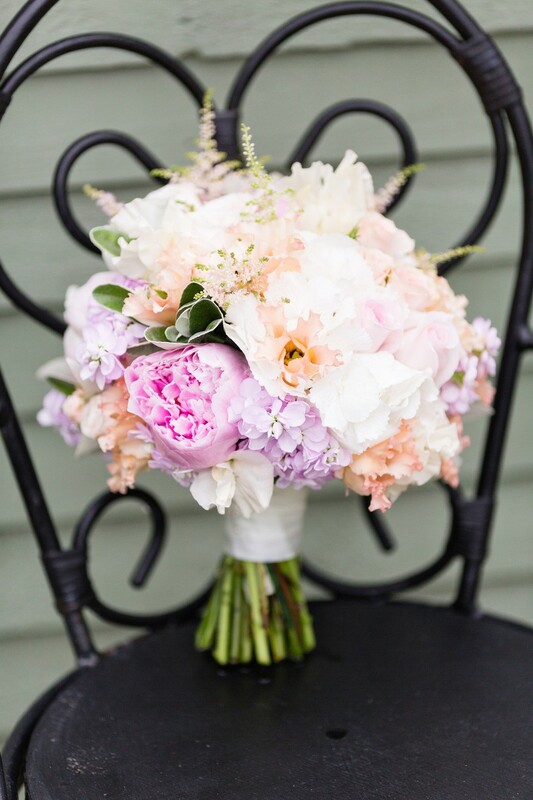 I had a flavour of what my flowers would look like but they took my breath away the morning of the wedding; bouquets, gents button holes, church displays, venue. All achieved in such a professional and non- intrusive style, living and breathing their motto of trusting them and leaving the work to them so that you can put your energies into enjoying the build up and the wonderful day itself. When I had extra budget to spend on flowers in the venue, Stephanie and Justin guided me so well to be savvy about investing in areas that would have the most impact and not in places where our guests wouldn't notice. The result was breathtaking and the ball room looked like something from an old movie of an old royal banquet. Some of my guests were moved to tears when they entered the room and the most talked about image from the day was the flowers from my own beautiful bouquet to the floral garlands as I walked up the aisle to being surrounded by beauty as we enjoyed our wedding banquet. I was so proud to have created a beautiful day for my family and friends to share but French Touch made my vision come to life. Here's to renewing our vows in years to come and having my flowers created by French Touch! That is the memory I have of wonderful people helping me create my wonderful day. Thank you Stephanie and Justin. Here's to the beginning of creating many beautiful life events in flowers throughout the years. Thanks so much to Stephanie in the French Touch. She was a dream to work with. Nothing was a problem and she did a wonderful job on our bridal party flowers, they were so vibrant and colourful. Thank you! I've only met with one florist and I knew straight away the French Touch was the perfect choice. I've met with Stephanie and she was very professional, she understood what we were looking for and the theme of our wedding. I wanted to get involved in the table decoration so I made the candle lights and she worked around this idea to complete the look of the table with the flowers. 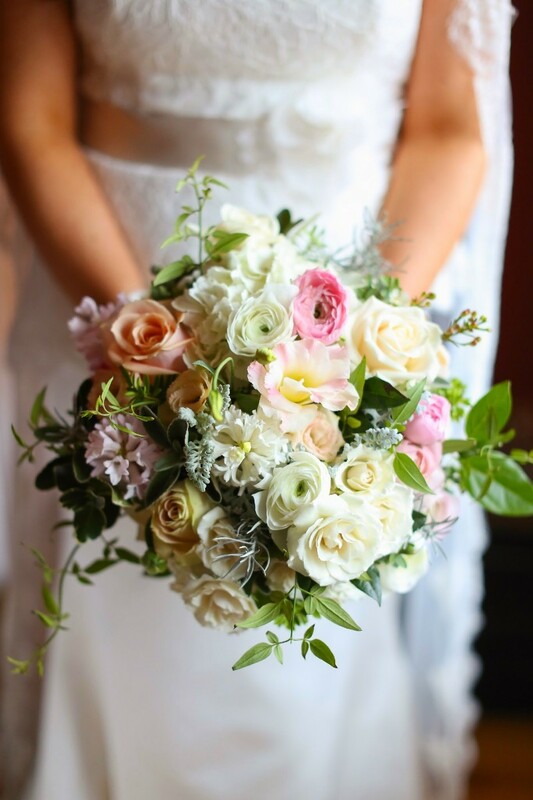 Despite the location (they're based in co.Kildare and my wedding was in co.Wexford) I was confident they would deliver and provide an excellent service which they did. Receiving the Bridal bouquet was very emotional for me and the bouquet was amazing, exactly what I had pictured and it lasted so long after the wedding!! I would highly recommend the French Touch for your wedding! Just a quick note to say a huge thank you to Stephanie for the amazing flowers at our wedding in July. The attention to detail was astounding resulting in beautiful, elegant flowers that fit into our vintage theme. I cannot recommend her enough for flowers that will stand out and enhance any wedding. We came across The French touch at a wedding fair early on in the planning stages. Initially we thought they were too far way to source our flowers but having met with other florists , none could match the creativity and the beauty of the French touch. After meeting with Stephanie we were so happy that we would get exactly what we wanted and not just the same old packages being offered by others. We had a say in what we wanted and Stephanie helped us with recommendations and advice where we were unsure. On the day I was so ecstatic when I saw the flowers in the church. And the mood that was created with the amazing candles along the back alter. I wanted my flowers to be something special and they truly were. My guests still rave about them. Thanks to Stephanie and Justin for, honestly, the best service that you could possibly wish for. We just wanted to say a big thank you to Stephanie and Justin for creating beautiful wedding flowers for our big day on April 4th. From our first meeting with Stephanie we were confident that she would do a lovely job of our wedding flowers. 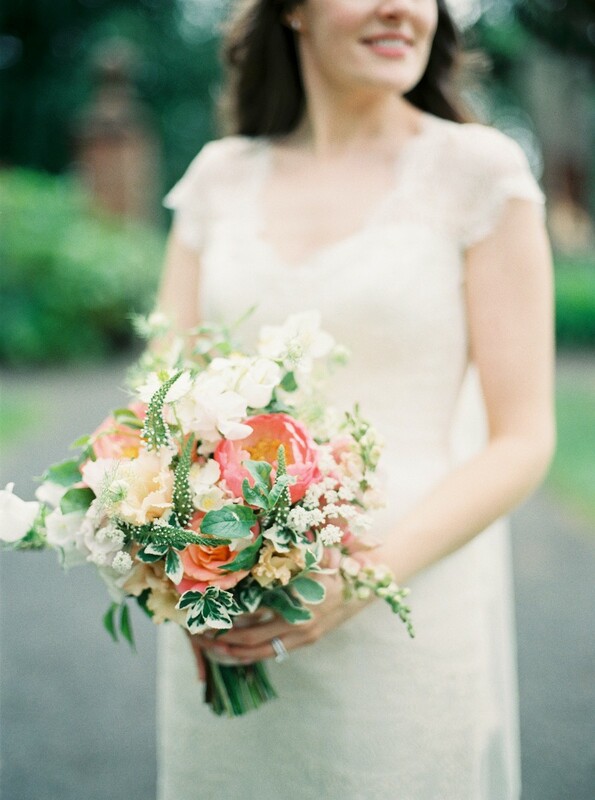 Her knowledge and expertise in selecting gorgeous seasonal blooms for our spring wedding was amazing. The flowers really succeeded our expectations. The bouquets, corsages and buttonholes were magnificent and the flowers in the church were perfect. Her advice was great and she really worked hard to suit our theme and budget. So many of our guests complemented them on the day. The French Touch are so talented at what they do. They were a pleasure to work with and we would wholeheartedly recommend them to any bride and groom planning their wedding. We got married last June and when people talk about our wedding, they talk about our flowers. Stephanie is just amazing at her job. During the hour long consultation she took some details from me and then presented me with her vision. She provided guidance on where I needed flowers at the church and venue and was available to answer my questions anytime in the run up to the wedding. Herself and Justin are complete professionals and everything ran like clockwork. 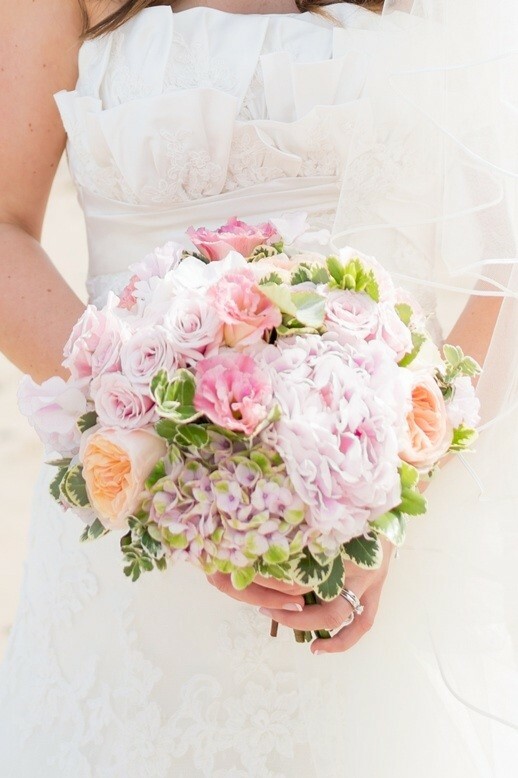 Our bouquets were sophisticated, soft and beautiful, the colours and choice of flowers were perfect. 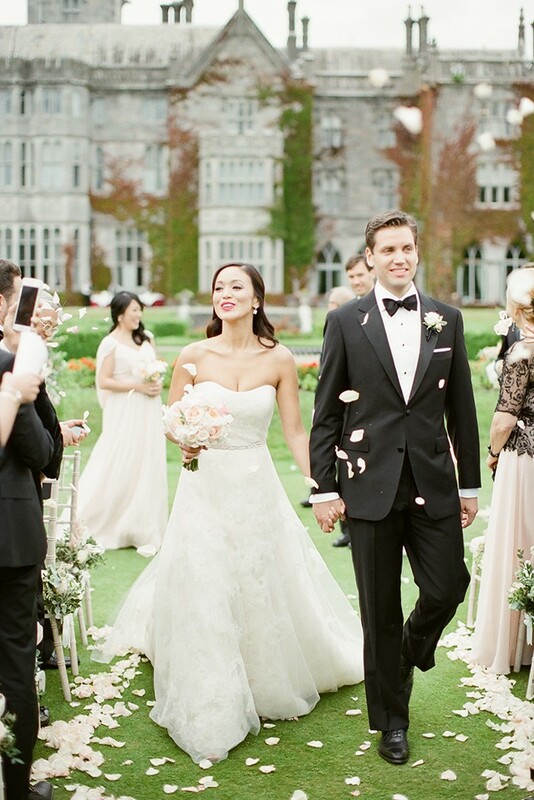 Stephanie made sure the church and dining room were full and bursting with colour and life. As someone else here mentioned in their feedback, you will not be prepared for how beautiful the flowers are when they arrive. I love looking at our photos and seeing how much the flowers add to the setting. 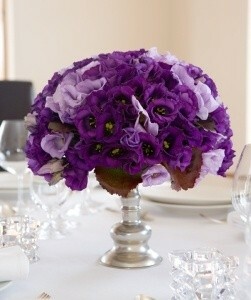 I have absolutley no hesitation in recommending The French Touch - they are simply a cut above every other florist. You will not regret booking The French Touch for your wedding. Dear Stephanie, I just wanted to say thank you for all your hard work. We had a fantastic day and your flowers played a huge part in our joy. The arrangements in the church and my bridal flowers were beautiful. I couldn't have imagined a more lovely display. They were absolutely stunning. The work and attention to detail was amazing. I knew as soon as I met you that you understood exactly what I was looking for, you listened to everything I had to say and then you put together a wonderful combination of arrangements that worked perfectly on the day. As soon as I have photos I will send them on to you. Everyone admired you beautiful flower arrangements. Stephanie, thank you for all you hard work in ensuring we had a very special day. Thank you so much Stephanie for helping to making our day so very special. When i arrived at the Church, I just could'nt believe how beautiful it looked. The flowers on the pews were amazing and the urns at the top of the alter along with all the candles were just magical. Thank you so much. Thank you so much Stephanie and The French Touch team. I knew when booking The French Touch that we would be in safe hands with our flowers and that whatever we ended up with would be beautiful. I was not prepared however for how blown away I was by the flowers when I saw them on the day. I coordinated our wedding from San Francisco and Stephanie was wonderful to work with over email and phone. When I saw the flowers on our big day at Tankardstown (June 22nd, 2013) words could not describe how happy I was. They were more amazing than I could have imagined. Literally every one of our guests commented on how amazing the arrangements were. Stephanie also was brilliant at working with me to pick the right accent pieces for the venue such as the bicycle basket and lavender pots for entrance way steps. Everything was better than expected and I feel so grateful that we went with The French Touch for our wedding day. Thank you!!! Stephanie & Justin, I wanted to say a HUGE thank you from Ken and I for the amazing bouquets which I loved, buttonholes and the fab church decoration - everybody commented on them! You are so talented and a dream to work with! Dear Stephanie, I want to thank you for the amazing job you did with the flowers for our wedding. The little chapel was just like a fairy-tale and the bouquets, reception room were breathtaking. I cannot tell you how many people were just blown away by your fantastic work. You were a dream to work with, you know your client and have such marvellous ideas. Thank you for making our day so magical. 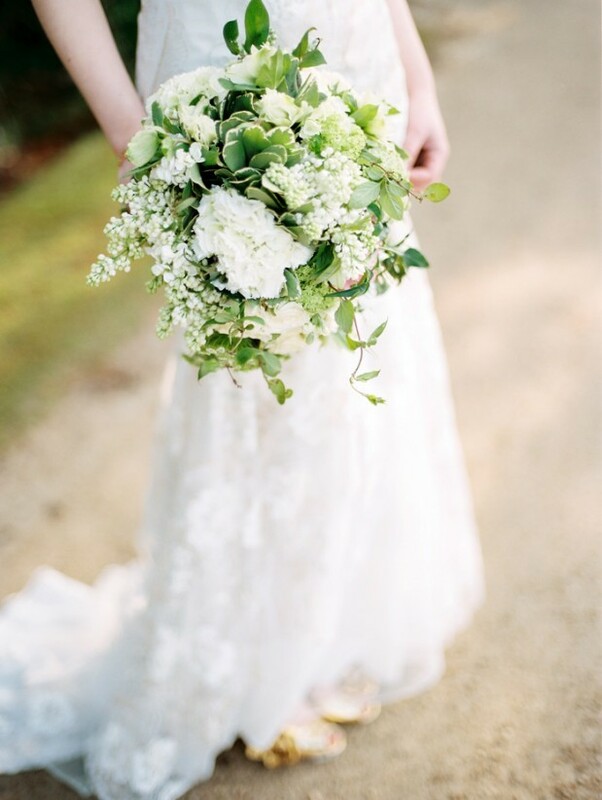 Stephanie and Justin, Declan and I would like to give you a HUGE thank you for giving us such stunning, elegant and fragrant flowers for our wedding at Bellinter House on March 18th! I adored my bouquet. It was so full and fragrant and generally fabulous as were all the flowers! A lot of our guests commented on how tastefully arranged they were. I was very excited to see how the flowers would look for our ceremony and reception room and they did not disappoint. We took every single arrangement home with us the day after the wedding and went on a home delivery service spreading their beauty around to neighbours, friends and family. The people we gave them to were very excited to receive them and one of my elderly neighbours actually cried when I handed them to her as she adores flowers. A very big thank you again. We would not hesitate to recommend you to our friends and family. We wish you the very best in the future! Dear Stephanie, I just want to send you a little note to say thank you so so so much for the flowers for our wedding. When I arrived home from the hairdresser and say them I started to cry they were just perfect. The ceremony room was just amazing with the flowers and arriving in was my favourite memory of the day as was the room where we ate. I sent all the flowers on the table home with the guest and they were delighted. Thanks again we were so so happy. After visiting many florists in the South East I was getting frustrated at the piece of paper being handed to me with an overall price and package and no one asking what I would like or what would suit my wedding especially when flowers cost alot, I was on a strict budget but really love flowers and really wanted something special, I came across the French Touch in a wedding magazine and e-mailed for an appointment, I met Stephanie for a coffee, straight away I knew I wanted the French Touch to do my wedding, she asked to see a picture of my dress and BM dresses and we talked about what would suit, I was thrilled so went ahead with the booking. On the day of the wedding I was thrilled and taken aback at how beautiful the flower arrangements were, walking down the aisle they were stunning and the bouquets. The guests loved the centerpieces and my aunts took some home that night to place of the grave of my grandparents. 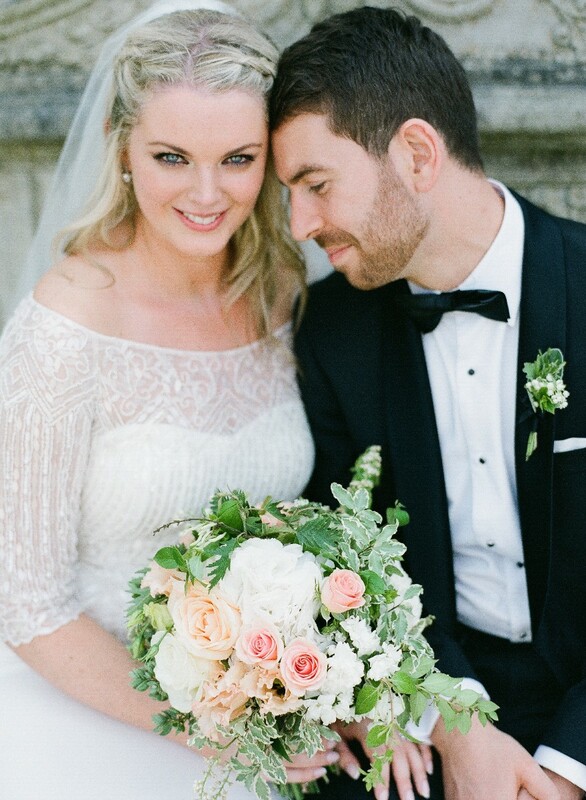 I cannot recommend the French Touch highly enough, for service and quality, they really are talented and quite simply they made me feel like my wedding really had the wow factor- Thank you Stephanie and Justin- Carlow Bride July 2012. Cannot speak highly enough of Stephanie & Justin at the French Touch. I met Stephanie a while before the wedding day, we discussed the look I had in mind for our arrangements and I gave her one or two lil pics. We discussed budget and she was happy to work within our means. On the day, the floral displays and bouquets they produced were just as I had hoped, if not better. All our guests commented on how beautiful the flowers were. The price for what you get back is so so reasonable. These florists have a real eye, real experience and really elegant taste. They know how to take one or two flowers and make them look even more stunning. Good job and Thank you! We had found the venue for our wedding but knew that it would be the flowers and the way the room was dressed which would really make it perfect. Things were difficult as we were based in the UK and so we really needed someone we could trust and who understood exactly what we wanted. From the first moment we met Stephanie and Justin at The French Touch we knew that they were the right people. We had worried about being able to achieve what we had in mind but we left our first meeting with Stephanie so excited and happy that we had someone helping us who knew exactly what to do. She knew the venue and painted such a vivid picture of what she was suggesting that we knew from that moment that what she was going to achieve would be quite extraordinary. Everything we said and discussed was taken on board. Nothing was forced on us. Stephanie was incredibly easy to talk to and when she emailed her proposal she'd hit the nail bang on the head.On the wedding day it all went like clockwork. The room was dressed and looked stunning. The guests could not believe what had been achieved and some were even checking the displays to see if they were real or not. Every detail was flawless, from the displays on the wall to the sweetpea flowers on the dinner tables to the flowers Stephanie dressed the wedding cake with. We would not hesitate for a second in recommending the French Touch. Stephanie's flowers and ideas made the venue perfect and set the tone for the day and we will always be thankful to her and The French Touch for that. We had the most beautiful flowers on the most beautiful day of our lives. The French Touch team were extremely professional and supportive leading up to, and on our big day. When it came to flowers for our wedding I wanted something simple yet something different. After looking through many websites and pictures I still wasn’t quite sure what exactly I was looking for but after a few short minutes with Stephanie I soon realised she knew exactly what I was looking for even if I didn’t! Once I knew she was on the same wave length as me I let her take total control and what she suggested and produced far exceeded my expectations. She was so good that I naturally thought that she was going to be much more expensive than other suppliers but I was pleasantly surprised to find that this is not the case and she even suggests flowers in season yet in keeping with your ideas so as to keep the cost down. I would highly recommend Stephanie and The French Touch, they are so easy to work with, extremely professional, so so creative yet value for money, what more could you ask for, brilliant! Stephanie was a true professional to deal with. I met her once only before the wedding as i left things quite late.However she took so much time discussing the different styles of floral arrangements and bouquets with me. She has brillant taste and advised me so well.I was absolutely thrilled with the flowers. I could not believe how many people commented on the amazing flowers as they were coming out of the church.The church looked wonderful as did the venue room.We held a barbeque the next day in the hotel and i got all the flowers from tables brought down. I also gave bouquets to people as they left the next day which was lovely. I have no hesitaion recommending The French Touch. The flowers arrangements and bouqets are really unique and really look amazing. Stephanie and Justin - Thank you both so much for doing the flowers for my wedding day. When I met you I was not even 100% sure what I wanted myself but you took the very vague idea I had and managed to turn it into exactly what I was looking for and the flowers on the day were amazing. Thank you both so much - It meant the World to me that I loved the flowers on the day - I really appreciate the work you put into them and also for understanding exactly what I wanted. Stephanie and Justin are by far the best in the business. There is no end to their creativity . Everyone complimented on how beautiful the flowers were on the day and commented on how unusual they were. I have recently got the proofs back from my photographer and the flowers light up every photo. I cant recommend the French Touch highly enough. We were so delighted with the flowers from The French Touch Flowers for our wedding. We had so many guests admire our beautiful bespoke bouquets and pew ends and floral arrangements. 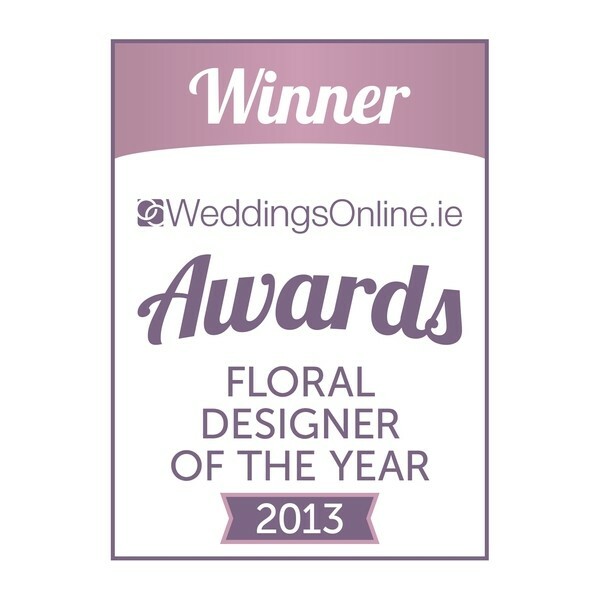 There is a reason they have won Florist of the year for the last few years and we wish them all the best for the future. We have no hesitation in recommending them to anyone for their wedding. Book the French Touch, you will not be sorry. Stephanie is so professional and got exactly what I was looking for and added some really nice touches.Our flowers were amazing the church looked beautiful, Stephanie was there from early making sure everything was perfect.As I said book the Frnch Touch you will not be sorry. An extremely professional, classy service at a very reasonable price.Thank you Stephanie for all your help. From the first moment we met Stephanie I knew we were going to capture the style we were looking for. She immediately understood our ideas even though I am clueless when it comes to flowers. In the end the bouquets were a very unusual flower that was perfect for my vintage style dress (many girlfriends commented on the bouquet) and the table and ceremony arrangements were perfectly tasteful and exactly the look I was going for.Along with great communication, understanding and expertise, the most impressive aspect of the French Touch was the meticulous attention to detail and added little extra's that brought life to the luxurious displays around the whole venue. I have to say, what a fantastic service. Stephanie was just so professional and a real pleasure to work with. She spent a lot of time with me at our first meeting and really knew her stuff - put it this way - I felt 100% confident in my florist in the run up to the day and on the day itself. Something I simply could not say about all my suppliers! Stephanie is very talented and has a beautiful manner, I highly recommend her. The French Touch offer the most bespoke and creative service for great value. 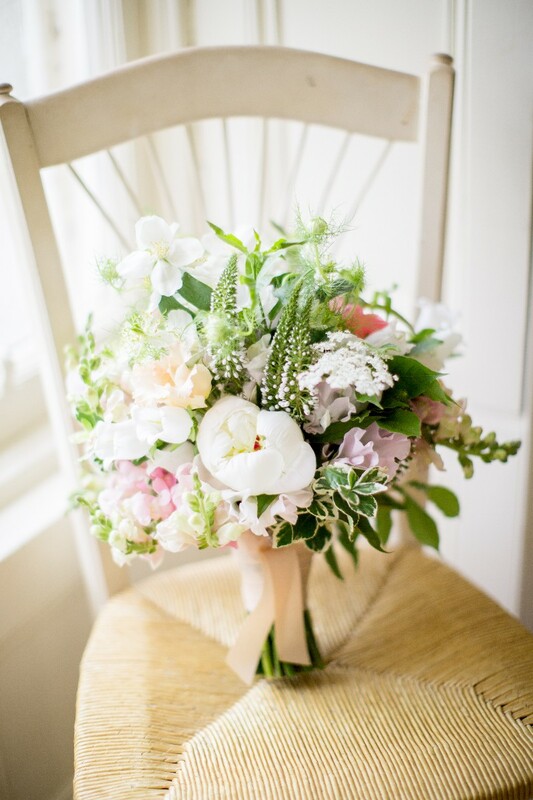 My wedding flowers were stunning and I really enjoyed sitting with Stephanie to work out the style of my bouquet and flowers for the ceremony. 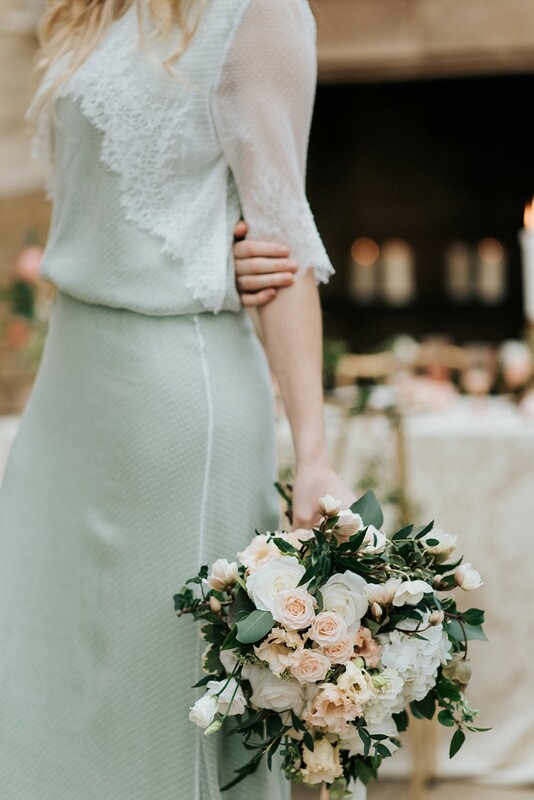 We also had beautiful vintage birdcages filled with candles and flowers as our centrepieces, they really made a difference to the mood of our reception and I would highly recommend getting in touch to organise your flowers... you wont regret it!Thanks to the French Touch for making my wedding flowers extra special. Thank you so much for the amazing flowers! The centre pieces were everything we imagined and more. The bouquets and church decoration were also beautiful, not to mention the seamless service on the day. We just got back from our honeymoon yesterday and seeing the photos reminded us how amazing the flowers were and how they added to the day. We're still getting compliments on the flowers weeks later! We'd definitely recommend you to any other engaged couples. I first met Stephanie at a wedding fair and spoke to her about what flowers I was thinking about for my wedding. Stephanie seemed really knowledgeable and creative so I felt confident that she would do a great job. 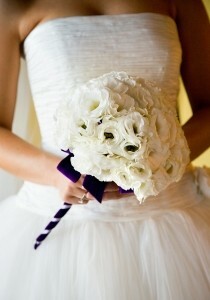 The bouquets were perfect – elegant yet in a loose style with a gorgeous satin ribbon hand tied into a bow. 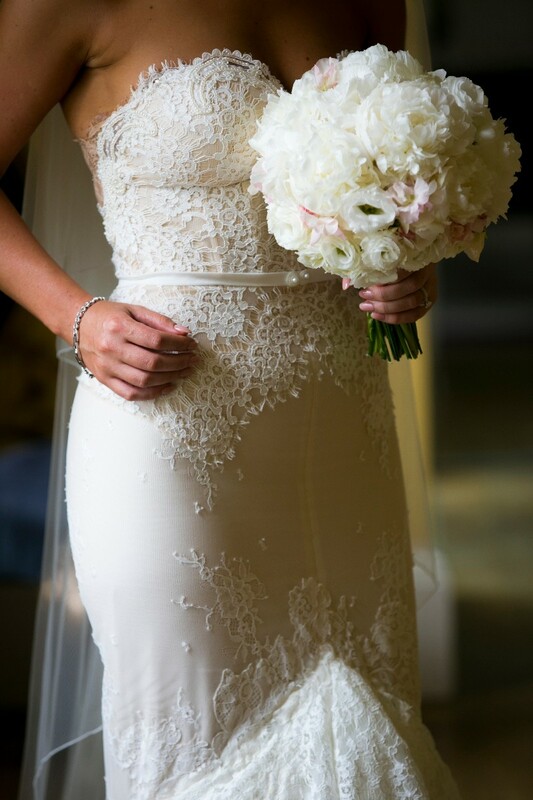 Stephanie used a variety of beautiful flowers which all fitted perfectly together. All the other flowers were fabulous too – from the buttonholes, to the pew ends, to the altar arrangements. They really made an impact in the church and looked beautiful in the photographs. I would have no hesitation in recommending The French Touch to anyone planning their wedding. 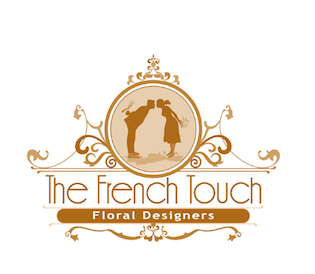 The French Touch are simply the best floral designers; no doubt about it! Stephanie has an innate ability to understand your vision and transfer your thoughts, no matter how vague, into the language of flowers. Her work is truly magnificent to behold. She brings each floral arrangement to life in a way that I have never seen before. I shed tears throughout my wedding service ... or at least until I was officially "Mrs" ! I thought I was all cried out but, when I took a step back to take in all of the decor, I was brought to tears again, as the flowers were just so beautiful. Our function room scintillated with candle light and the theme was offset with the most stunning flowers, colour combinations and originality, all thanks to The French Touch. You could almost feel the love and care that was put into our floral decor. Our guests were full of praise for the flowers, both on the day and for weeks to follow. Their comments may cease as the months pass by but we have memories to treasure forever. A million thank you's. I cannot recommend Stephanie and the French Touch highly enough. I met Stephanie at a wedding show and her flowers just stood out a mile. From the first meeting she was just fantastic, very easy to get on with and full of brilliant ideas. The bouquets were even more beautiful than I had imagined and they lasted for days. They were packed full of flowers, every time I looked at mine I seemed to see a new flower! They received lots of compliments from the guests too. The French Touch were very professional on the day, and perfectly organised. From beginning to end a real pleasure to deal with. Stephanie was wonderful to deal with. I had a very definite idea about what I wanted - daisies and more daisies! I had spoken to a number of florists who seemed to try and dissuade me from my theme and I was starting to get anxious that I would have to compromise and have less than my perfect vision. I researched and researched and read lots of great testimonials about The French Touch, so I decided to contact them and see could they help me. Stephanie could not have been more different from the florists I had spoken to before! She replied to my initial email with such enthusiasm for my daisy theme, suggesting that chamomiles could work as an alternative to garden daisies. When the wedding day came, I was over the moon with Stephanie's creations - from bride and BM bouquets and buttonholes, to fabulous pew bouquets, altar arrangement and giant urns, to gorgeous table centrepieces. Everyone commented on the pretty flowers and it is still a talking point for guests, 5 months on! Thank you Stephanie - you listened to me and created my perfect Daisy Day! Our wedding would simply not have been the same without Stephanie and the stunning arrangements she created for us. When we got engaged I knew I wanted a spring wedding with lots of colourful scented flowers and Stephanie brought the ideas to life. All our guests commented on them and their perfume filled the reception room for the night. Thank you so much. I first came across The French Touch, through a wedding magazine site, after spending hours looking for Wedding Designer/Florist to suit my wedding theme look. I was looking for a shabby chic/french country look for our wedding. When I met with stephaine for a consultation she knew exactly what i wanted. She was very helpful and patient and made planning for our flowers very easy. 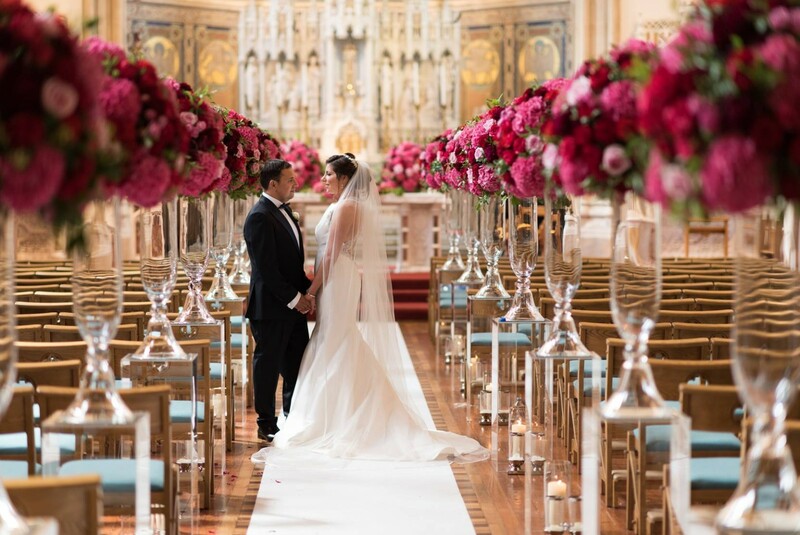 On the day, the French Touch exceeded our expectations, our church and venue had that wow factor, its amazing how much of an effect that flowers can make to a room. I would highly recommend the French Touch to anyone who is planning on getting married! Stephanie and Justin came highly recommended to us by a friend who got married last year. From the first meeting to the 'Big Day' we received outstanding service. The precision in presentation and organisational ability, technique and professionalism was evident throughout the weeks leading up to the wedding. Stephanie listened very attentively to our ideas while leaving us open to her suggestions and design so that we felt comfortable and confidant in our final choice. The quality,timing of transportaton, and condition of blooms was absolutely outstanding. 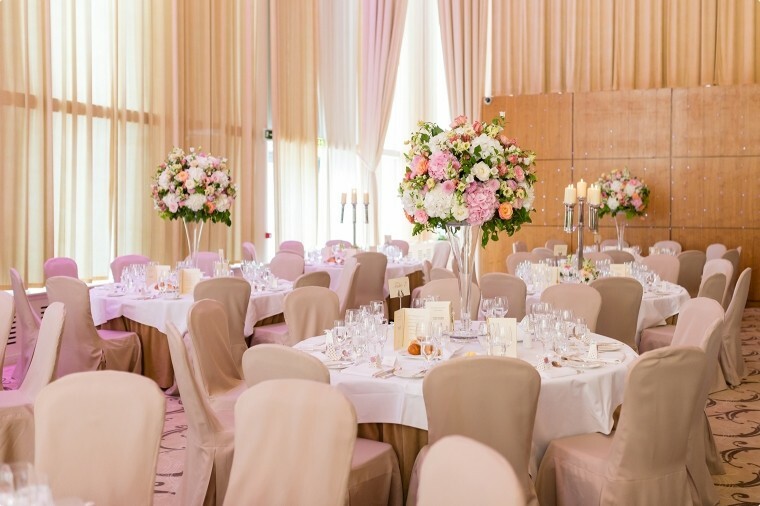 The elegance of the arrangements is captured perfectly in our photographs. The next day the flowers were as fresh and wonderful as the day before and we were able to use them for a party the next day. Thank you Stephanie and Justin for creating the 'wow' factor that we wanted so much for our special day,for your enthusiasm and for your personalised service throughout. Stephanie, Thank you so much for doing the flowers at our wedding in August – it was an absolute pleasure to deal with you. From your patience at our first meeting when we had no idea where to begin! Thanks for taking the time to give us lots of great ideas. And when we were making final decisions, you gave us great guidance and advice. I knew just from dealing with you that your flowers would be stylish and elegant, and on the day the bouquets, buttonholes, ceremony decorations and table arrangements still managed to exceed our expectations! The flowers were perfect and added so much to our day. I cannot recommend The French Touch highly enough. Thanks again Stephanie. To Stephanie and Justin, Just wanted to say thank you so much for doing such a wonderful job with flowers for our wedding. The flowers were exactly what I had in mind and I totally knew from our first consultation that Stephanie fully understood the look and theme that we wanted but the flowers turned out even nicer than I had imagined! We were both delighted with them.Thanks again. 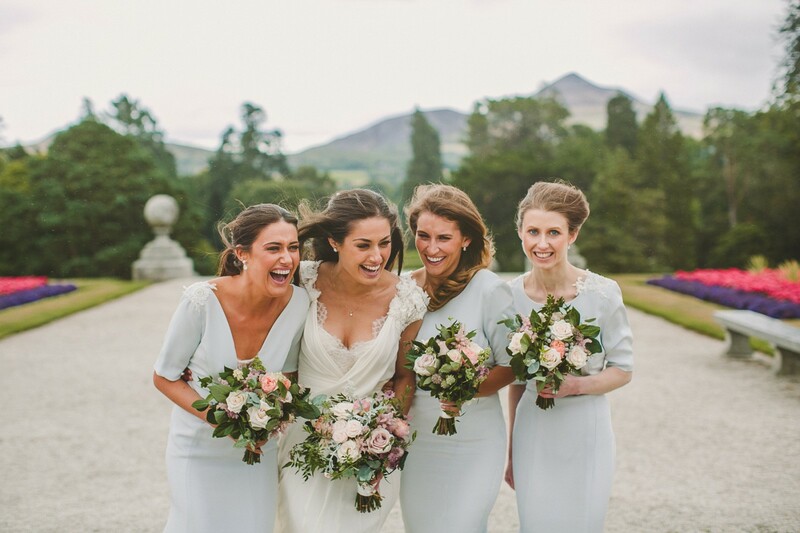 I met Stephanie a few months before our wedding in Borris House in September, and from that one meeting she knew exactly what I wanted, what would suit me and went above and beyond that. Our flowers were absolutely stunning and our guests are still raving about them. Stephanie's a true genius. Thank you so much to The French Touch. Stephanie in the French Touch is great. She is so creative and has so many unusual and outstanding ideas. Our wedding guests are still talking about the fantastic flower arrangements on the tables... and the bouquets were just fabulous! Within 5 minutes of meeting Stephanie she had interpreted exactly what I had in my head for our flowers and what they delivered on the day was even better! As far as I'm concerned she is in a league of her own compared to any other florist we had seen. The flowers were so fresh, delicate and arranged so beautifully that they really helped make both the day and the photographs. 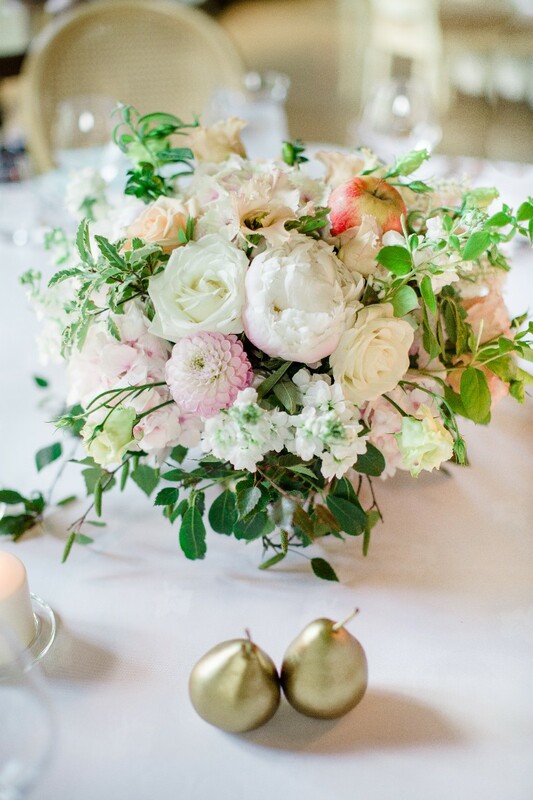 The French Touch did an amazing job of the flowers at my Wedding in April. My bouquet was a little ray of sunshine in what was a cloudy day!! Also the flowers in the church really stood apart from the norm, and so many people commented on them. Also Stephanie gave me great advice on the best use of my budget, which was great - and even ordered beautiful Orchids for my hair at the last minute, lifesaver!!! Would wholeheartedly recommend The French Touch!!!! Stephanie was absolutely wonderful to work with. She really understood my ideas and my vision and helped me bring it to life. She is a true artist and everyone commented on how beautiful the flowers were on my wedding day. I would 110% recommend Stephanie & The French Touch....they were amazing! Stephanie did our flowers for our wedding in Brooklodge at the begining of July and they were exactly what I wanted and more. Just beautiful. Stephanie was so great to deal with and is clearly a talanted lady! Thanks so much again to the team!! Stephanie did the flowers for our wedding in June 2010. They were absolutely glorious. I didn't get to see any of the bouquets or buttonholes or decorations at our venue until I walked up the aisle of the room we were getting married in. The flowers were everything we'd discussed and more - they were stunning and a talking point throughout the day. As well as producing magnificent flowers, Stephanie was a delight to deal with - efficient and responsive, she made the whole process easy. A very definite recommendation! Hi Stephanie - thank you so much for our wonderful flowers. They were everything I hoped for and much more. It was an absolute pleasure to deal with you. You gave me some wonderful ideas and they really worked well on the day. I would recommend the French Touch to anyone that is getting married and looking for inspiration and perfection. Thanks again.